Last time out for me, with the Royal Shakespeare Company, was to see their outstanding, remarkable and bloody production of Titus Andronicus in the Swan Theatre. 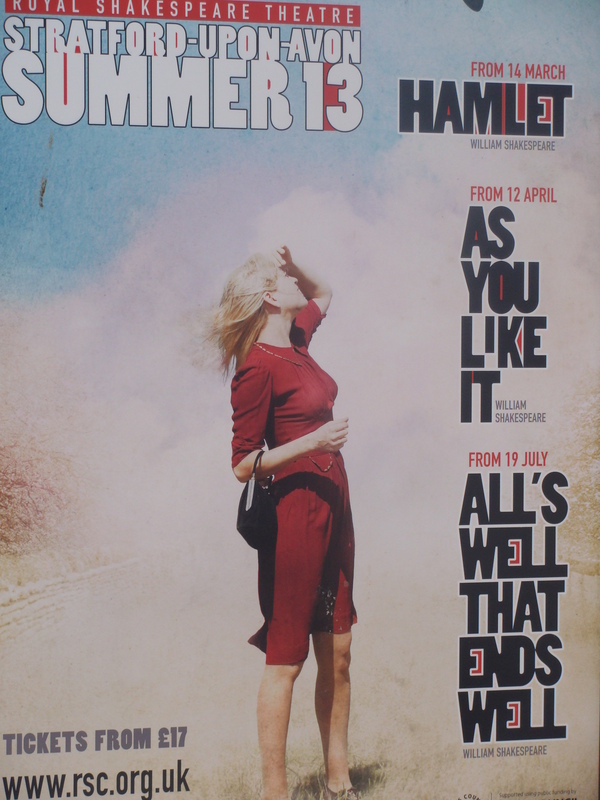 This time I’m in the main Royal Shakespeare Theatre watching a solid but not quite as remarkable version of All’s Well That Ends Well. The strong suit with All’s Well That Ends Well comes (in something of a parallel with Titus Andronicus) with the female half of the cast. There has been a lot of talk in the last few years about how there is a deficient number of strong female roles in Shakespeare. Obviously nobody told the members of the current RSC ensemble. Particularly strong here are Joanna Horton as Helena. Shakespeare has Helena bravely set out from Rossillion to Paris disguised as a pilgrim. 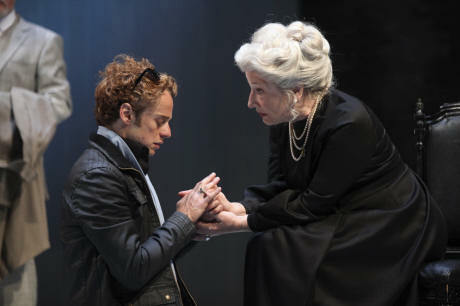 In reality, she is seeking to conspire to marry Bertram (Alex Waldmann) by obligating the King of France (Greg Hicks) to grant her favour when she brings him healing. She plays the role with charm and sincerity and we are drawn in to pull for her to achieve her rather unlikely goal. Charlotte Cornwall is the Countess of Rossillon. The Countess grants Helena permission to go on her pilgrimage in her hope of marrying the Countess’ own son. 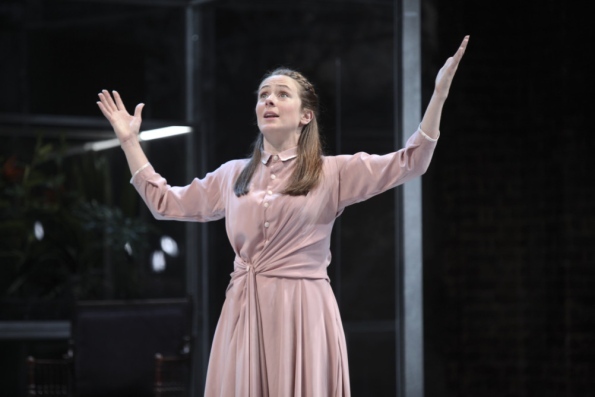 Ms Cornwall creates a good rapport with the audience with strong asides and eye contact and makes us feel in on the plot and all the machinations that will eventually bring Bertram under the guile of the women in the play. There is also a strong bond between the two female actors which creates the sense of two who want to be mother and daughter for each other. Greg Hicks, as the aforementioned King of France plays a convincingly wan and weak role before his healing and a lively and likeable King after he is restored to health. But it is two actors that I have been critical of before who in my view weaken this production. Jonathan Slinger who has produced some magisterial performances in the tragedies, has, in my view, a much narrower range in the comedies. 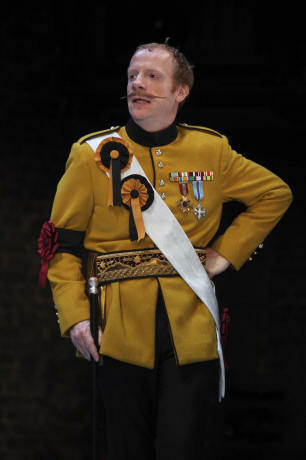 Here, as in previous performances in The Comedy of Errors and Twelfth Night, his idea of a light-hearted comedic performance is to combine a strange laugh (kind of Kenneth Williams meets Gordon Brittas) with a mincing effeminate manner and bizarre costumes. His Parolles has the stupidest moustache that I have seen on a stage in a long time but had little else which was remarkable or innovative. Also struggling for range is Alex Waldmann who essentially plays from the same deck here that he did in King John. 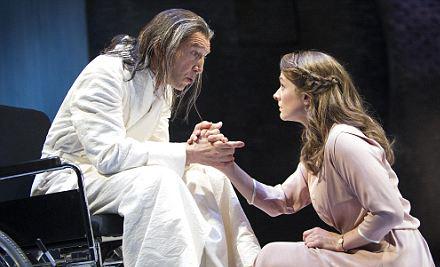 I’ve yet to be convinced that he has the ability to carry the roles that he is been given by the RSC and the two lead roles I have seen in him have been particularly lacking. The opening scene set in a disco or dance party also brought back echoes of the recent King John production which here was a considerable distance from the manner of the main body of the play and brought nothing to the rest of the presentation and was done in a manner which was never touched upon again in the rest of the play. So overall, more strengths than weaknesses and an enjoyable night at the theatre and as the title hints if you feel a warm glow as you leave the theatre, you will soon forget some of those shortcomings. This entry was posted in Review, Theatre, William Shakespeare and tagged darren hirst, drama, journalism, play, review, royal shakespeare company, rsc, shakespeare, stratford-upon-avon, william shakespeare by twilightdawning. Bookmark the permalink.